Melbourne Computer & E Waste Recycling | 1800-GOT-JUNK? Electronics waste is a growing problem here in Australia, where millions of outdated computers, mobile phones, batteries, and televisions are being discarded every year. Unfortunately, all of these products contain substances that can be toxic to people and the environment, which is why e-waste recycling is so important. Here at 1-800-GOT-JUNK? we make disposing of your electronic waste simple and stress-free with our Melbourne computer recycling and e-waste pickup service. We'll come right to your home or office, load up all your unwanted electronic items, and take everything away to be recycled at an approved e-waste management centre. Products like photocopiers, printers, gaming systems, and tablets are made up of a wide variety of materials like plastics, glass, and metals, and when handled correctly, most of these materials can be re-claimed and used to create new consumer goods. Those same durable materials that help our electronic devices stand up to daily wear and tear also create a big problem when it comes time to dispose of outdated devices - these electronic devices are not biodegradable. When items like smart phones, laptop computers, and stereo systems wind up in our landfills, they begin to leach out toxic chemicals like lead, arsenic, and mercury. Over time, these toxins can wind up in the water table, leading to serious, irreversible contamination of our drinking water. E-waste recycling ensures that all the toxic chemicals in electronic items are safely removed and handled in a way that protects people, animals, and the environment. And because materials like metals, glass, and plastics can be recycled, e-waste recycling also helps to reduce the demand for the raw, non-renewable resources it takes to create plastics and metals. As the world's largest junk removal company, we're serious about keeping recyclable and reusable materials out of our landfills - that's why we're happy to offer computer recycling services throughout Melbourne. When you have computers and peripherals like monitors, scanners, and printers that you no longer need, we're here to help. 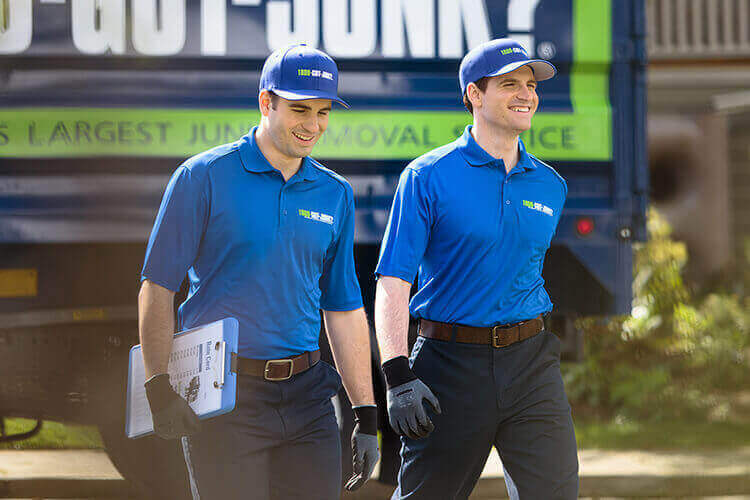 All you need to do is call us at 1-800-GOT-JUNK? or go online to book an appointment that fits your busy schedule. Once we arrive on time, simply point out all the e-waste, computers, and any other junk you'd like us to haul away for you. We'll give you a clear, all-inclusive quote on the spot - if you like us and our price, we'll work quickly to clear out all of your junk, sort everything out for you, and take everything to be recycled for you. While you can't prevent your electronic devices like computers, televisions, and smart phones from breaking down or becoming obsolete, you can take control over what happens to all of your unwanted electronic items. When you call us for Melbourne computer recycling service, you can rest assured that you're doing the responsible thing - you're ensuring that your devices don't add to the growing problem of e-waste here in Australia. At 1-800-GOT-JUNK? we believe that together with our conscious customers, we can create a brighter future by constantly striving to find new and better ways to improve upon our industry-leading environmental track record. We're passionate about providing safe, accountable e-waste recycling and junk removal services. When you're ready to free up extra space in your home or office by saying goodbye to all of your e-waste, we're here to help. Call us at 1-800-GOT-JUNK? or go online to schedule your Melbourne computer recycling pick-up service today, and get ready to enjoy relief from your old, outdated electronics.